This article was updated at 10:50 a.m. EDT. Some blame President Trump. Some blame an increase in Big Oil donations. Some say Congress has failed to craft significant environmental legislation. Others say the GOP has abandoned its roots as the party of conservation. Decades ago, under Republican administrations, Congress established EPA, passed the Clean Air Act and set up the Superfund program, among other green achievements. But tribalism appears to have hijacked national politics. EPA under Administrator Scott Pruitt has sought to roll back environmental regulations, Trump dismissed climate change as a "hoax," and the words were essentially banned from the agency. So far this year, major environmental groups have endorsed this many Republicans: zero. It comes as more than 40 GOP House members embrace the idea that humans are causing climate change. A few years ago, only a handful did. "It's a confluence of the Republican Party shifting farther to the right and increased polarization," said Jennifer Duffy of The Cook Political Report. "Interest groups on both sides of the aisle want more purity from the members they endorse." A veteran environmental leader who spoke on the condition of anonymity said 1 in 5 endorsements by environmental organizations used to be for Republicans. Now, these groups only back a couple of federal GOP candidates every cycle. "Republicans' increasingly poor voting records reflect their rejection of the conservation leadership provided by such presidents as Theodore Roosevelt, Richard Nixon and George H.W. Bush," the green leader said. "Opposition to federal climate action and pollution reductions are now litmus tests for potential Republican candidates." In 1990, the League of Conservation Voters endorsed 22 Republicans in the House and the Senate. This year, none. LCV is not alone. This drop-off has also occurred in the Sierra Club's political committee, which has not endorsed a national Republican candidate this year. From 2008 to 2016, the group endorsed seven Republicans compared with hundreds of national Democrats. In state and local races, which are often less partisan, environmental groups tend to support far more Republicans. Sarah Burton, director of the Sierra Club political action committee, pointed to the Republican mayors of Abita Springs, La., and San Diego, Calif. — both of whom are moving their cities to 100 percent clean energy. "There is a lot of bipartisan work happening in the states," added Kevin Curtis, executive director of the NRDC Action Fund. "In my optimistic moments, I hope that bipartisanship will roll up and influence the federal level. In my pessimistic moments, I worry that the hyperpartisanship that we see in Congress will flow down to the states." While green Republicans complain that environmental groups are a front for the Democratic Party, green groups say the national GOP has increasingly failed to back environmentally conscious policy. "We have to acknowledge that there is a very strong, strong sense of tribalism that has taken over the Republican Party," said Bob Inglis, a former South Carolina Republican congressman who founded the climate nonprofit republicEn after he was unseated in 2010. "I hope it's temporary." The LCV scorecard, which rates lawmakers on clean energy issues, shows that the divide between Republicans and Democrats has never been starker. In 1970, House Republicans voted with LCV on average 37 percent while Democrats voted with it 50 percent. In 2017, House Republicans voted with it 5 percent while Democrats voted with it 94 percent. The scorecards compile a laundry list of votes on environmental issues, which critics say do not always paint a complete picture of a politician's record. Craig Auster, LCV's PAC and advocacy partnerships director, said fewer Republicans are supporting pro-environmental policy because GOP leadership has become so extreme and polluter money so powerful. "We evaluate candidates on their environmental records, not their party affiliation," he said. 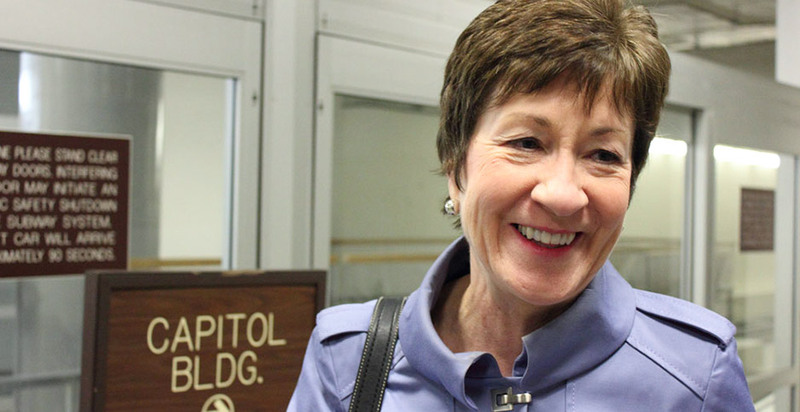 In fact, in 2014, LCV endorsed two Republicans — Maine Sen. Susan Collins and New Jersey Rep. Frank LoBiondo. The following cycle, LCV decided not to support LoBiondo. He is not running for re-election this year. Four years ago, Collins also received a nod from the EDF Action Fund. She was known for being one of the few national Republicans to talk about climate change at a time when it was politically deadly. One former Democratic candidate lamented that the bar is higher for Democrats, even as some mediocre Republicans can squeak an endorsement out of green groups. In 2016, LCV and the Sierra Club endorsed Republican House candidate Jason Walser, who lost his primary election in North Carolina. Walser had headed the LandTrust for Central North Carolina. Old-school Republicans say the party has moved away from its conservation roots. "It's not an anti-Republican move on the part of environmental groups," said Sherry Boehlert, a former New York Republican congressman who chaired the House Science Committee and now sits on the LCV board of directors. "It's an anti-environmental move on the part of Republicans." Still, many green Republicans often gripe that major environmental groups are merely fronts for the Democratic Party. While Inglis acknowledged the polarization of the national Republican Party, he said Democrats share some of the blame. He said the environmental left has done a disservice to the environmental movement by almost entirely funding left-leaning candidates. "It's not just the Koch brothers funding climate disputation," Inglis said. "It's the environmental left making climate change toxic for Republicans and proving themselves to be totally untrustworthy when a Republican shows the courage to stand up." Similarly, Curbelo of Florida, who co-founded the bipartisan Climate Solutions Caucus, has lamented that some environmental groups are doing a disservice to the cause. Curbelo named EDF, the Nature Conservancy, the National Audubon Society and the Citizens' Climate Lobby as truly bipartisan organizations. Barry Rabe, a professor of environmental policy at the University of Michigan, noted that Congress hasn't passed meaningful environmental legislation in more than two decades. But he added that wind and solar energy have begun to make up a meaningful portion of electricity generation in the central United States. "That plays out in these legislative races," he said. "I don't see this cleavage as necessarily permanent. ... We'll know more after November."